The PSC is a logical progression and maturation of our POU temperature control system. LAUDA-Noah continues to meet the demands of <32nm technology nodes for 200mm & 300mm Plasma Etch applications. Improved Power Supply Controller - The "PSC"
The PSC is the result of years of accumulated customer feedback, testing and development. It is a backward compatible alternative to prior discontinued PSC models. Its design incorporates state-of-the-art technology into a single, "universal" PSC. The PSC is designed to support all versions of the POU 3300 & POU 3500 modules and for all Etch tool types and applications. All prior discontinued PSC models are fully supported with our PSC upgrade program. Backward compatibility The PSC is a pin-to-pin compatible and interchangeable alternative to the discontinued models PSC4400 and PSC8800. It is designed for "Plug and Play". Improved reliability The PSC incorporates multiple design improvements and state-of-the-art components, which improve reliability and reduce faulty alarms. Height and weight The PSC height is 2/3 of the PSC and weighs 30% less. This reduces space, lowers shipping costs and simplifies installation. Universal design The new front panel design is modern and has a more distinctive look and feel. The part count for the PSC has been reduced significantly, which improves reliability and manufacturability. A single common PSC reduces spares inventory and simplifies logistics. Optical communication Communication between the tool and the chiller is with a microcontroller over an optical bus. Isolating the communication eliminates noise prone analog signals and faulty alarms to the PSC. Energy efficient The PSC is significantly more energy efficient than the PSC making it a more economical choice. The power devices in the PSC run cooler, which increases system reliability. 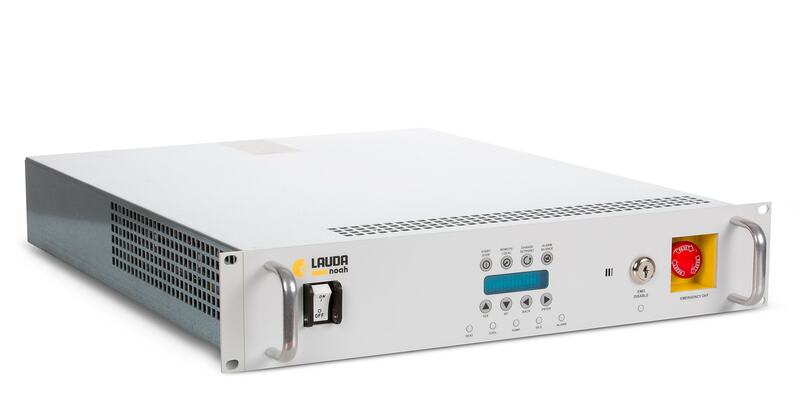 Remote Communications Module for 300mm Digital Protocols - The "RCMe"
The LAUDA-Noah RCMe gateway provides digital interfacing between LAUDA-Noah POU systems and 300mm process tools that communicate with LonWorks* and DeviceNet* protocols. 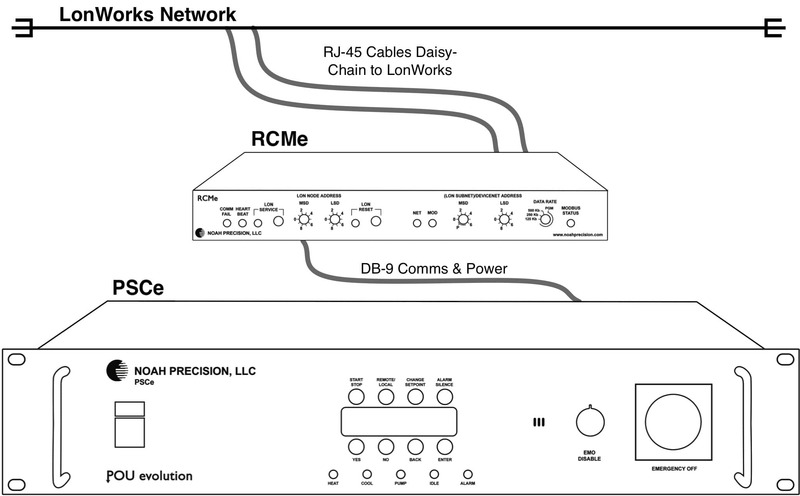 For Lam 2300 chambers utilizing LonWorks, the RCMe takes the place of the Lam Gateway (D-to-A), Lam Gateway power supply, LAUDA-Noah Lon RCM (A-to-D), and many interconnect cables, thereby providing significant cost savings and increased reliability, as well as more accurate and reliable temperature control. This interface has been designed to be compatible with all LAUDA-Noah PSC models. NOTE: The DeviceNet portion of the RCMe will remain dormant until market demand for LAUDA-Noah POU systems upon equipment supported solely by DeviceNet triggers the necessary RCMe revisions.